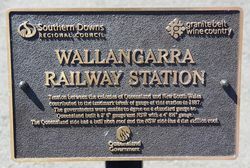 The Historic Engineering plaque commemorates the Wallangarra Railway Station. This interchange was opened in 1887 to link the different railway gauges adopted by Queensland and NSW. The Chief Engineers of the respective railway systems were Henry Stanley and John Whitton. Queensland narrow-gauge trains used the western side of the station and NSW standard-gauge trains the eastern. 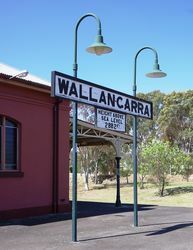 The passenger station is in Wallangarra QLD and the goods facilities (now demolished) were in Jennings NSW. The value of the interchange declined with the opening of a standard-gauge link through Kyogle in 1930.